In the studio again after a long break. After seventeen years of painting throughout the each summer I decided to take a break for the summer and didn't spend much time in the studio painting. I didn't do much photography either and truly enjoyed the time away. 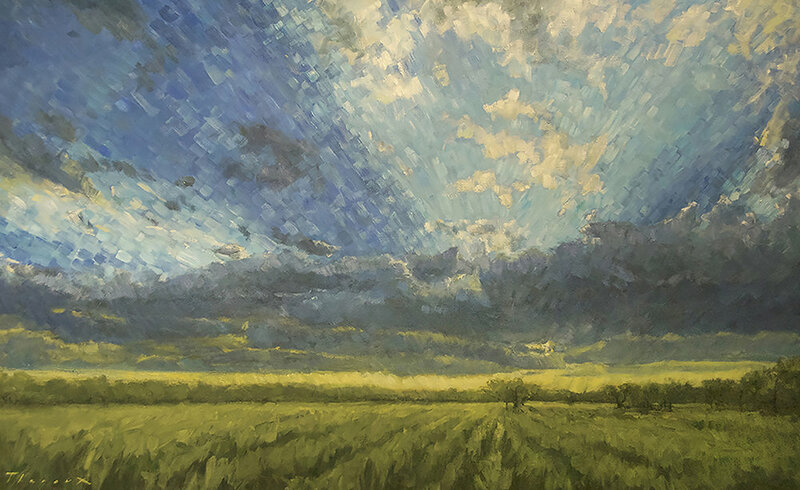 I did finish up a piece I started in May by working on rainy days, BELLE PLAINE 30X48 oil. I love being an artist, but it's still work, albeit a job I have loved from a very young age. I enjoyed being able to engage with nature and all of the sights and sounds around our place here on the Great Spirit River, Wakpa Wakan (Ojibwe) a.k.a. rum river. without feeling I needed to get something for a painting, or take a photo or capture a scene, or remember colors or atmosphere. I was able to enjoy all of that, just for the sake of the experience. My wife Dawn and I did a lot of fishing on the river, we got a few big Bass this year and saw so many creatures on our travels up and down stream. Rivers are like wildlife highways, there's always some kind of activity, Eagles, Owls, Osprey, Fox, Coyotes, Otter, Deer, Beaver just to name a few. I do believe we love the rivers, especially the one we are blessed to live above. Thank you Great Spirit.